If there is one thing that Joshua “The Passion” Pacio wants to regain heading into his rematch with ONE Strawweight World Champion Yosuke “Tobizaru” Saruta, it is his never-say-die mindset in a crucial bout. 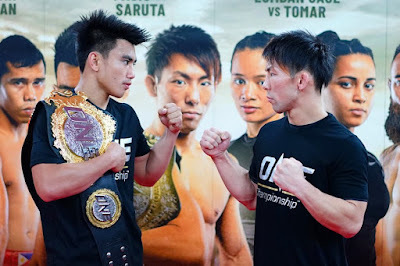 Pacio admitted that he lost a bit of confidence in their first outing, and he vows to showcase that when they go at it again in the co-main event of ONE: ROOTS OF HONOR, set for 12 April at the 20,000-capacity Mall of Asia Arena in Manila, Philippines. “Now I need to focus even more, I need to be more confident,” he said. Saruta put together a tremendous performance, scoring a monumental upset of Pacio to capture the ONE Strawweight World Championship. The Japanese phenom was relentless with his chain wrestling, taking Pacio down on numerous occasions while trading powerful combinations on the feet. Throughout five action-packed rounds, both Saruta and Pacio put forth their best effort. In the end, it was Saruta who was able to garner two of the three judges’ nods to win by split decision. Although Pacio truly believes that he won the first contest, the 23-year-old Team Lakay standout understands where the judges are coming from and it is one of his key takeaways from his first meeting with Saruta. “I hope to showcase the things that I wasn’t able to show last January,” he stated. The difference for Pacio now is he comes in as a hungry challenger, who is eager to prove himself as a mixed martial arts competitor. “I need to be more aggressive, especially being the challenger. I’m hungry to prove myself again and bounce back,” he declared. Now that he gets his rematch, in his home country nonetheless, Pacio is certainly fueled to get back to the top of his division and give the hometown crowd something to cheer about. There is pressure, especially with the hopes of the country resting on his shoulders. But rest assured, his drive and willingness to win far outweighs that. “It’s pretty much the same. I’m excited and even more motivated because the rematch will happen here in the Philippines,” Pacio shared.